I’m now in Manila and the Gun Bar is firmly located in Singapore for the foreseeable future. How ever will I get my regular dose of beating up on Anthony? Simple really. 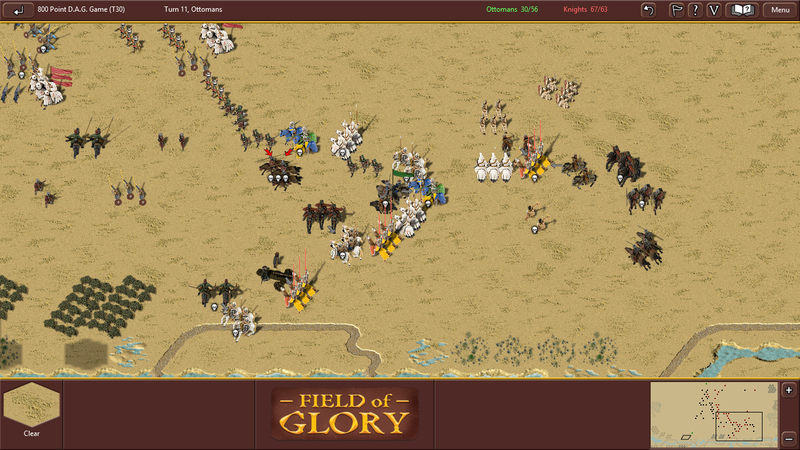 Field of Glory On-line. Neither of us really likes Field of Glory rules but the on-line version has us not worrying so much about the rules as everything is resolved internally, in the computer’s memory. The other down side is that it is impossible to determine if there is any dice feng shui, something we have got used to at the Gun Bar. We just finished a game, 800 points a side and therefore a big game. We tend to start one big (800 point) digital army game and one scenario game (with both sides being played). The scenario games can be quite challenging. When we both lose the same side, it does suggest that the scenario is unbalanced. Anthony’s left has somewhat redeemed the failure of his right. The last digital game we played however was from the Eternak Empire Group. I took the Ottoman out against the German knights led Knights Army. The two illustrations here are the position at the end. My left flank had overwhelmed and broken his right flank whilst his left flank had achieved the same result with my right. I had, however, manager to secure sufficient casulaties in the Knight to win. The Ottoman Forced are shaded slightly. We are in the process now of starting another game – this time my Sassanians are shaping up against a Principate Roman force.